Choosing a butterfly knife can be an involved decision. There are several things to consider. The first to consider is price range. You can find butterfly knives from just a few dollars all the way up to several hundred dollars. As with most things, the more you spend, the better knife you will most likely get. But that isn’t always a guarantee. Some of the low cost butterfly knives can be perfect for what you are looking for, and some of the very expensive butterfly knives may be more for show than actual performance. The next thing to think about is the size of balisong that you are looking for. There are very small balisongs available–some are about the size of a keyring. Then there are giant balisongs, some as big as 3 feet or even more. If this is something you plan on carrying around with you so you can practice your moves when you have a couple of minutes, a 9″ is most likely the size that is perfect for you. Then there are the construction materials. What is the handle made of? 6061 stainless steel is a high quality material that is used in the Kimura Butterfly series by Bradly Cutlery Company as well as many other of the high end butterfly knives. Some of the very top end butterfly knives have handles that are made of titanium. One thing to think about with the handles is the shape and weight. Some people prefer big, bulky handles and others prefer a thin handle. Most of that is personal preference. What you do want, is a butterfly knife that swings smooth on the pins. And here is one of the big questions to consider when choosing a butterfly knife. 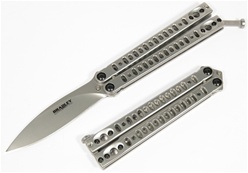 Do I want a butterfly knife built with pin construction or with hex screw construction. You will find inexpensive and expensive knives built both ways. The thing to remember is that if it is hex screw construction, then you will most likely need to adjust and tighten the hex screws from time to time. Since the parts are moving, eventually the screws can loosen and fall out if you aren’t attentive to them. The benefit of screw construction is you can adjust the “tightness” of the blade so that it swings just how you like it. Pin construction butterfly knives, on the other hand, are attached with pins that aren’t removable. A good example of this is the Bear & Son butterfly knives. Most of their knives are pin construction. With these, you have no issues with the screws coming loose because there aren’t any. The issue you can run into is that if the pins are too loose, it isn’t something you can adjust and so your butterfly knife will have a somewhat “sloppy” swing to it. When you get ready to choose a butterfly knife, these are just a few of the things to think about.